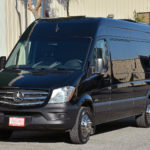 The Perfect Vehicle For Conferences, Corporate Events, Business Functions and More! DENVER IS A GREAT PARTY CITY. But, we can be all business when we need to. 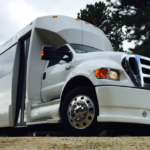 If you’re doing business in Denver or are planning a corporate event here – we have the vehicle for you. With exciting new economic opportunities, a thriving tourist scene, affordable real estate and a perfect climate, Denver is a city on the move. 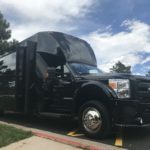 Our Denver mini coach rental will give you the help you need to provide comfort and professionalism in just the right combination – whether you’re picking up a delegation from the airport, attending a business expo or taking your team to the mountains, we have a mini coach to get you there! Our newest vehicle is here! 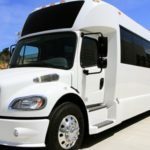 The brand new 2018 luxury coach has the size, style, comfort and prestige for the biggest and best corporate events. The white luxury coach is uniquely equipped. 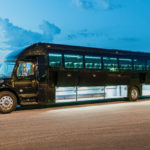 it has the large capacity of a bus combined with the luxury and prestige of a limousines, and with 8 screens onboard, it can even be a mobile multimedia suite! 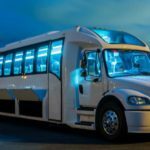 New For 2018 – a Brand New Luxury Coach, perfect for corporate events. 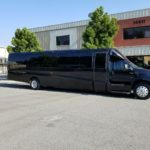 Sunset Limos has the largest and highest quality limousine fleet in all of Colorado. 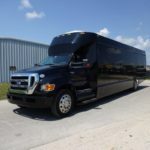 We have been servicing the Denver Metro Area for over 25 years and our limos are clean, luxurious and will never look cheap. Our professional chauffeurs are courteous, licensed and are trained to make every limo experience the best. But don’t take our word for it; read what our clients are saying about us on Google and Yelp, or click here to read reviews and testimonials from our satisfied clients.